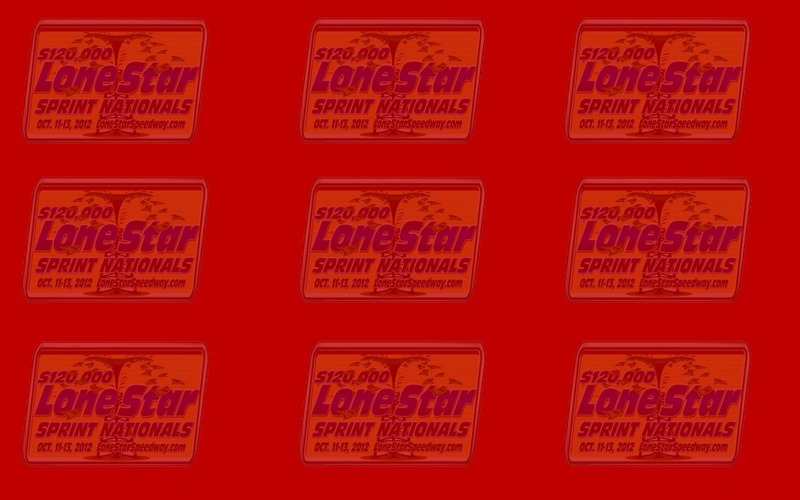 Welcome to the 2012 LoneStar Sprint Nationals Information Hub! Outlaw Wings & ABC Auto Parts! Click Navigation Buttons Above or Below for Driver Registration, Host Hotels, Event Info & Much More. For sponsorship inquiries or questions, feel free to email Darin at: dssm93@msn.com. CLICK HERE FOR CAMPING INFO. thereby saving them $150 compared to waiting to enter the event upon arrival. pictures, current entry list and much, much more. 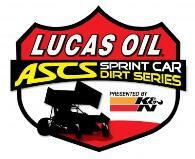 a total of 131 Sprint Car and RaceSaver® Sprint Car division entries. and pit parking requests will be fulfilled on a first-entered basis. 3/8 mile clay oval. 117 teams participated in 2011, with over 100 racing each night. RaceSaver Sprint Cars. No time trials. and just $20 on Saturday’s blockbuster event. Division purse slated for 2012. -General Admission just $15 (ages 12 and older) on Oct. 11-12; $20 on Oct. 13. -Seniors/Military (Ages 65+, General Admission) $13 on Oct. 11-12 and $18 on Oct.
-All Pit Passes $30 on Oct. 11-12; $35 on Oct. 13. -A 3-day discounted pit pass will be sold online through Oct. 8 for $90. entries will not appear on the entry list until their official registration has been filed. (Inside the Texas 150 Business Park). deck of the LoneStar Speedway pit area. mix of drivers entered from seven states is already taking shape. Terry McCarl and 9-time 410CI champion Danny Lasoski. yellow flag fly in its 40-lap distance. make her own mark on the LoneStar high-banks. straight nights...and all for a 1980's style 3-day grandstand pass of just $40. to win and $100 to start in the wildly popular RaceSaver Sprint division. Car numbers are awarded on a first-entered basis, so enter soon to get yours. Here are the current LSN entries received, as of 7/6/12. click http://www.LoneStarSpeedway.com for track information. dssm93@msn.com for event sponsorship inquiries. 11-13, 2012; and today, driver registration to the event opens. registered – before someone else gets your number first. www.darinshort.com/SCN.html to view the flyer details. Darin at dssm93@msn.com for event sponsorship inquiries. RaceSaver® Sprint Cars. No time trials. just $20 on Saturday’s blockbuster event. $11,000 increase in the Sprint Division purse slated for 2012.
registration page, which will go live on March 1.
food and merchandise vendors, as was the case last year. not able to make it to the event. They will also provide post-event video footage. 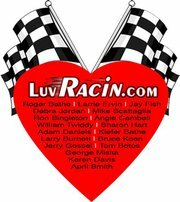 website from Don Cook of the Ft. Worth Star-Telegram and RacinBoys.com. enclosed trailer teams will be pitted in the infield of the track, as in 2011. -A 3-day discounted pit pass will be sold online through Oct. 9 for $90. -Gates open at 5pm, with racing at 7pm each night. Pits will open early each day. fully functional at launch, Thursday March 1st. didn't make the big show - thanks to KJC Auto Title Loans! America today...and click their link to save $1,414.14 on your next home! partner or sponsor, email Darin at dssm93@msn.com for more information. website, Sprint division registration and flyer. 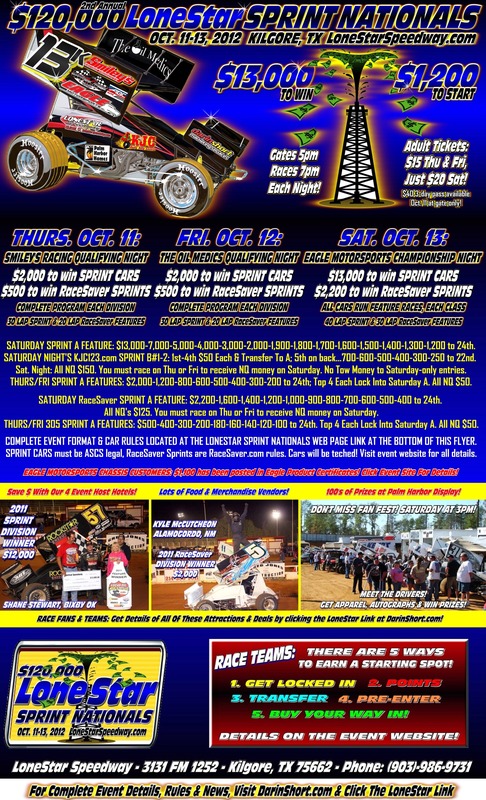 now to join us October 11th – 13th at the LoneStar Sprint Nationals! CLICK THE 'GET ENTERED' BUTTON TO RESERVE YOUR CAR NUMBER & ENTRY IN THE EVENT! for sprint B at 7:00 sharp. cars hot lap in each division. NEW 2012 FAN ZONE PAGE NOW UP!